The Database Selector dialog box lets you connect to your studio's central database when working on Harmony Server. When you connect to the database, you cannot create new scenes directly from Harmony. The available scenes must have been already created using the Control Center module. In the log-in dialog, select Connect to Database. In the User Name field, type in your Harmony Server username. Lets you select the scene's environment (project, movie). 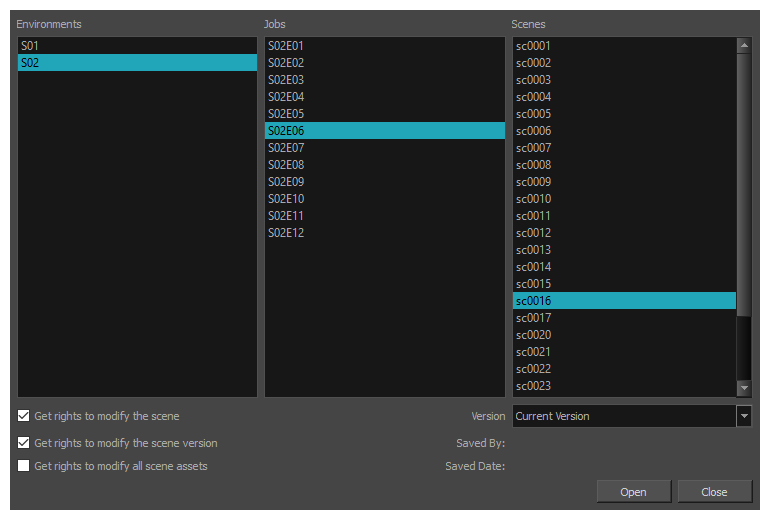 Lets you select the scene's job (episode, sequence). Lets you select the scene. Automatically gets the rights to modify all of the scene's assets, locking other users from making changes to them until you close the scene. This means that you will have the rights to modify all the scene's versions, drawings, palettes, its palette list, but not its library folder. If this option is unchecked, drawings and palettes will be locked unless you unlock them manually. This can allow another user to work on the scene's drawings and palettes in Harmony Paint while you are working on the scene's timing or staging in Harmony. If you saved different versions of a scene, this lets you select one to open—see About Saving in Harmony Stand Alone.